THIS was a historic afternoon for Celtic, but the facile nature of the victory made it a non-event for the neutral. Brendan Rodgers' side became the first Scottish team to win back-to-back trebles, and there was never really any doubt hanging over the outcome at Hampden Park. It went to form. Celtic are all the conquering champions who finished their league campaign with the handbrake up. Motherwell ended up on the wrong side of the top six, bottom six split and the gulf in quality was apparent throughout here. The underdogs, who were captained by Irishman Carl McHugh, tried to be combative - and they did cross the line on occasion - in an attempt to give the favourites some headaches. But they were only ever going to prevail by keeping it tight early and hoping that nerves set in for their richer and stronger opponents. When Celtic's Callum McGregor found the space to unleash a superb rising footer into the top corner in the 11th minute, there was already a feeling of game over. 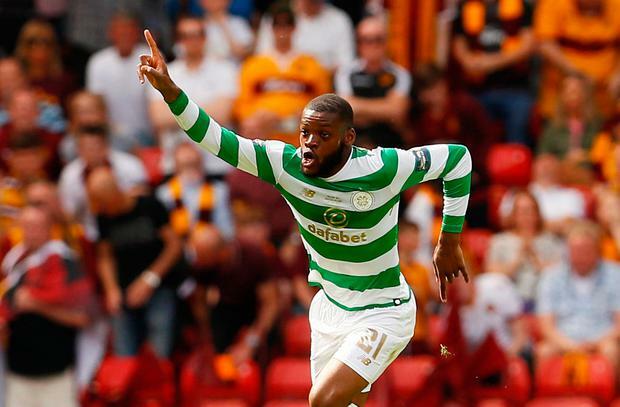 It was confirmed a quarter of an hour later when Olivier Ntcham fashioned the opportunity to arrow a shot from outside the box that was outside the reach of Motherwell stopper Trevor Carson. It allowed Celtic fans to enjoy the Glasgow sunshine as their side coasted their way to another trophy. Motherwell did try and raise a gallop after the interval and they had their moments, but Rodgers' charges were always comfortable. Donegal man McHugh was withdrawn before the hour mark as they vainly went in search of a route back to the game. Alas, the best contribution from a Motherwell player was a brilliant stop from Northern Irishman Carson to keep out Dembele's header. Sub Gaël Bigirimana did strike the crossbar in a late rally for Motherwell, with Celtic inviting some pressure, but the suspense levels were limited. The triumph kicks off a weekend of celebration with Martin O'Neill bringing a side to Celtic Park tomorrow to provide the opposition for Scott Brown's testimonial. For the hosts, it will be an occasion for some old favourites - including Henrik Larsson - to tog out again and roll back the years. Rodgers' current group are well on their way to writing their own history.